“Are there croissants?”, Brigitte Bardot asks. “No, but I have three songs”, Serge Gainsbourg answers. For Gainsbourg, sigarettes, women and music were the basic necessities of life. Gainsbourg: A Heroic Life is both a loving depiction of the fantasy of France’s most controversial singer-songwriter, and an elegant summary of the muses and demons that helped him create numerous songs that conquered our hearts, and loins. The women in Gainsbourg are well cast and convincingly portrayed by actresses Deborah Grall (Elisabeth Levizky), Sarah Forestier (France Gall) Laetitia Casta (Brigitte Bardot), Lucy Gordon (Jane Birkin) and Anna Mouglalis (who will be giving a Master Class today, see opposite page) as Juliette Gréco, the singer who helped Gainsbourg on his way. While the film may hold little surprises for fans of Gainsbourg, the music is very well interpreted and the hero is respectfully portrayed in all his colors. Although the film is over two hours long, director Joann Sfar breezes through Gainsbourg’s life story. She begins at the beginning, when the young, talented and cheeky seducer Lucien Ginsburg was already different from his peers. A Russian Jew raised in Nazi-occupied Paris, little Lucien makes the most of the misery: he quits secondary school, attends painting classes and is taught to play the piano by his father. 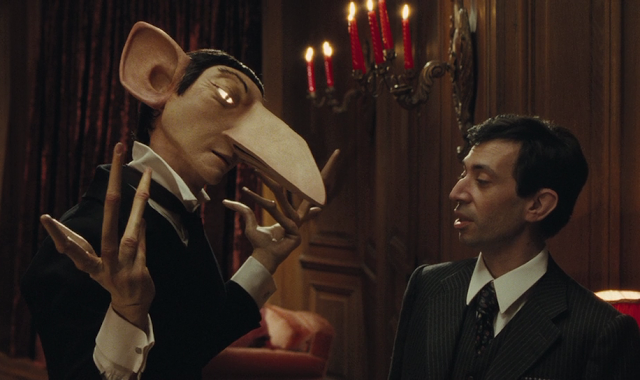 Sfar illustrates Lucien’s imagination and playfulness by letting the iconic antisemitic imagery of the time step out of the posters and come to life as life-size puppets, who accompany him throughout the film. By playing with these symbols Sfar elegantly translates the development of Gainsbourg’s scarred identity, forever insecure about his big nose and ears.